Juniper’s security solutions seamlessly extend across private and public cloud architectures without compromising security, flexibility, and manageability. 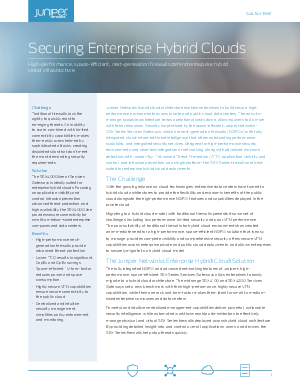 With midrange, high-performance, space-efficient, next-generation firewalls, smarter and faster centralized management, and highly evolved security intelligence and automation tools, Juniper Networks allows you to secure your network, keep operational costs down, and easily migrate to a hybrid cloud architecture. contact your Juniper Networks representative.